No Christmas Cheer For 'The Coopers' The Coopers are yet another family who've gift-wrapped their dysfunction and brought it home for Christmas. (Left to right) Amanda Seyfried, Jake Lacy, Olivia Wilde, Maxwell Simkins, Blake Baumgartner, John Goodman, Ed Helms, Alan Arkin, Diane Keaton and Alex Borstein make up the Cooper family in Love the Coopers. The Coopers have a gorgeous kitchen. And since it's Christmastime, those granite countertops are lined end to end with magazine-ready displays of food: fresh chocolate pastries, fluffy mashed potatoes, brilliant red tomatoes, a shimmering glazed ham with pineapple slices. The extended family gathers only once a year under the same roof and Charlotte (Diane Keaton), the matriarch, wants everything to be perfect. Even Rags, the family dog, has a festive red bow tied around its neck. This is all pretext for a holiday entertainment that feels more like a horror movie. 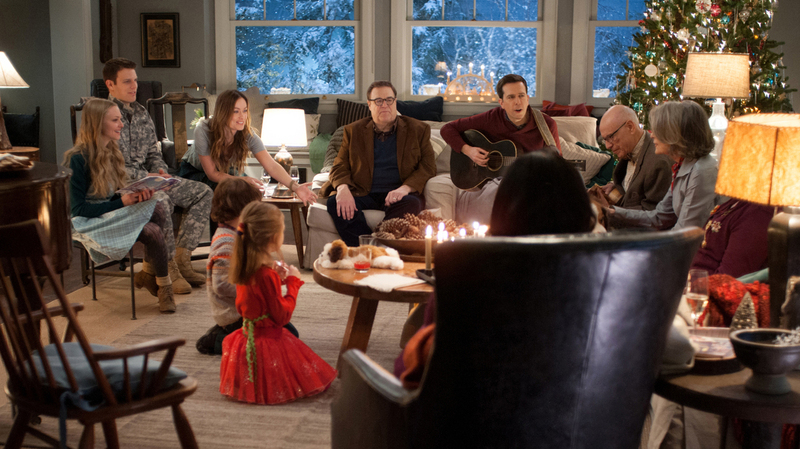 In the ignoble tradition of Home for the Holidays, The Family Stone, and other seasonal heart-warmers, Love the Coopers presents itself as a wacky ensemble dramedy, but it's really a cry for help. Christmas is supposed to be a catalyst for change, but the contrast between Charlotte's immaculate stagecraft and the mass dysfunction that lands on her doorstep makes the whole film brittle, tense and joyless. Marriages are ending. Sibling relationships are strained. Charlotte's adult children roil with anxiety and resentment. Even the grandkids are swearing and getting into fistfights. With minimal tweaking, the film could be turned into a Buñuelian picture of bourgeois collapse. With Steve Martin providing the novelistic narration — his true identity is the last of the film's eye-rolling jokes — Love the Coopers lays out a series of family subplots, each more depressing than the last. Charlotte intends to leave Sam (John Goodman), her husband of 40 years, after the holidays are over, but begs him to keep the bad news under wraps. Their daughter Eleanor (Olivia Wilde), a pushy big-city type, so fears her mother's disapproval that she ropes a straight-laced military man (Jake Lacy) into acting like her boyfriend. Their son Hank (Ed Helms) is a still sadder case, an unemployed mall-portrait photographer whose marriage has fallen apart. It scarcely gets cheerier from there. Eleanor's resentful sister Emma (Marisa Tomei) gets caught shoplifting a brooch and spends most of Christmas Eve pleading with a cop (Anthony Mackie) from the back of a police cruiser. Grandpa Bucky (Alan Arkin), a retired professor, is so desperately lonely that he goes to a lousy diner just to talk to a waitress (Amanda Seyfried) who's friendly to him. Meanwhile, batty Aunt Fishy (June Squibb) and Hank's daughter (Blake Baumgartner), a Cindy Lou Who lookalike, are stealthily competing to say the most inappropriate thing at the dinner table. With a cast this big and star-filled, it's perhaps inevitable that most of the subplots feel woefully underserved, but nothing in Love the Coopers suggests that they'd benefit from the extra attention. Director Jessie Nelson, who has experience with both Keaton (Because I Said So) and Christmas (Fred Claus) as a screenwriter, toggles between these mini-psychodramas with the grinding artlessness of a network TV show. But TV shows have the advantage of following the ebb and flow of family relationships for seasons at a time; a movie like Love the Coopers treats Christmas as a car wash that polishes up bruised feelings and leaves a mistletoe hanging from the rearview mirror. Though Love the Coopers follows the holiday-movie playbook to the letter, right down to the main course sliding across the hardwood floor, it doubles as a distinctly uncomfortable reading of the upper-middle-class American family. When the Coopers are sitting in a room together, there are so many pockets of discontent that their resentment rings at a higher frequency than their ritualistic Christmas carols. They can't stand each other, but they go through the motions of a happy family, led by Charlotte and Sam, who refuse to disclose that their marriage, the very foundation of the Cooper clan, is actively crumbling. Love the Coopers is a Christmas movie for families incapable of talking about their feelings until they explode. It's to be watched through your hands.